I met E.T. The Extra-Terrestrial (with the help of movie magic)! - A review of what it was like to act in a scene with a science fiction hero. I met E.T. (with the help of movie magic)! Back when I was a little kid, I saw Steven Spielberg’s now classic movie, E.T. The Extra-Terrestrial, for the first time; I was entranced. 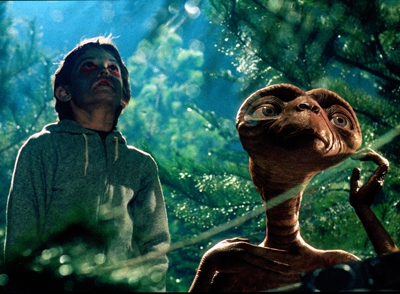 In the movie, a ten-year-old boy finds a lost little alien and tries to help him to find his way home. Unlike most of the movies that I saw during my childhood, I never forgot E.T. Many years later, in celebration of the Blu-ray release of E.T. The Extra-Terrestrial for its 30th Anniversary, a few journalists were invited to reenact a scene from the movie, with the help of movie magic. I was one of them. When I arrived for the shoot, I could tell that I was in for something special. A big green backdrop seemed to glow in the darkened room. On some monitors was a still image of E.T. and adorable little Elliot (Henry Thomas) from the goodbye scene of the movie. I was handed a bright-red, zip-front sweatshirt, like the one that Elliot wore in the movie; I promptly pulled it on. The director played back the original movie scene for me, and then I was led in front of the camera. As the camera was adjusted, I glanced at a nearby monitor. 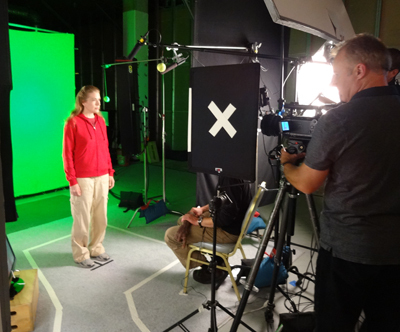 On the monitor, I was no longer in front of a green screen; I was in a forest with E.T.! My attention was directed to a tennis ball. Another man put a camera slate near my face. He “clapped” it and then stepped away. I looked at the tennis ball and tried to imagine that I was looking into E.T.’s eyes. It was an interesting experience, trying to get emotional to a tennis ball. But things were about to get even more interesting! 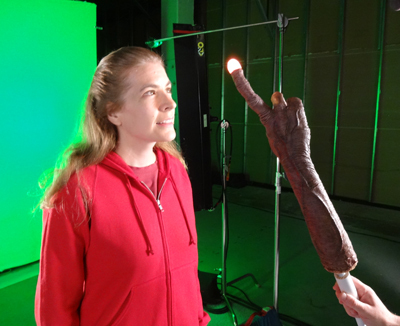 When we rehearsed the next piece of the scene, a special effects man lifted up an arm that looked like it belonged to E.T. 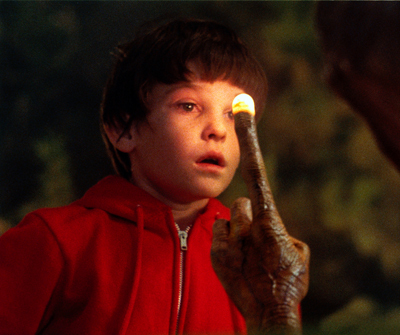 In this part of the scene, E.T.’s finger was going to almost touch my face and then begin to glow. I was told to watch E.T.’s finger as it moved closer and closer and then, after the finger lit up, to look back at E.T.’s eyes (i.e. the tennis ball). I looked at E.T.’s arm, imagining that it was real; it was the closest that I would get to meeting E.T. until the people in the editing room worked their magic. After we shot the final part of the scene, the only thing left to film was my back. This footage would be used in the foreground of E.T.’s close-ups. I stood on a second t-shaped mark, facing away from camera. After one take, we were done. When I saw the final cut of my scene with E.T., I couldn't believe my eyes! See it for yourself in the clip below. The E.T. The Extra-Terrestrial Anniversary Edition Blu-ray Combo Pack will be released on October 9, 2012. Now a whole new generation of kids can fall in love with E.T., just like I did! *Jen attended a press event for the Blu-ray release of E.T.